Some SW readers (especially those with whom I am friends on Facebook) may have noticed that my Aunt Suzie often comments on cocktail posts with something like, “I still love a good ol’ G’n’T!” She’s absolutely right. At the end of a summer (or spring, or fall…) workday, I rarely want to fuss with a complicated cocktail, no matter how delicious the end result might be. In this instance, a little gin, a little tonic, and a little lime are all you need to achieve a perfectly balanced drink. I do credit Suzie (not my biological aunt, but much closer to that distinction than most of my parents’ brothers and sisters) with introducing me to the gin and tonic, though probably too early for me to truly appreciate it. At the time, I preferred the champagne (doctored with a touch of Chambord) that was offered at the table. Before this introduction, I have never tasted quinine. It’s one of the those flavors (like Campari or Strega) that induces a “face;” a physical reaction to the flavor that shows up in the mouth, eyes, nose, and even ears. Usually, it resembles a wince. Given time and the appropriate amount of familiarity, one develops an affinity for these unusual flavors. They become desirable, and even quench some kind of unique thirst. 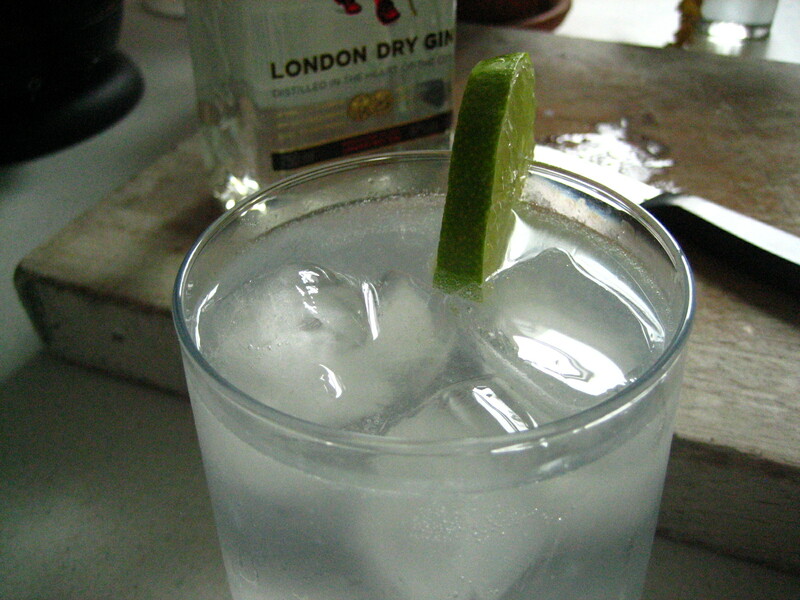 Now, having consumed more gin and tonics than I’d ever be able to recall, I associate them with many pleasant memories. Any and all interactions with my dearest friend Tim in London and stateside. Ridiculously youthful evenings at Club Cafe in Boston. Summer nights with Suzie in her beautiful, idyllic backyard in Pittsburgh. And, of course, ballroom dancing with Christine umpteen years ago, where we drank them for the very first time. We noted the bitter quinine and the fact that gin tastes like pine trees. How very young we were. So, here’s to my fabulous Aunt Suzie, without whom the joys of the gin and tonic would’ve been kept from me for at least a few more years (until Tim came along). To her health, her happiness, and her indomitable spirit. Cheers! I agree with Aunt Suzie, I love a good G’n’T. I started drinking them during my semester in England. I often get comments about the taste from my co-workers and friends when I order one when we are out. I just reply more for me then, you don’t know what your missing. It’s such a nice crisp refreshing drink versus so many of the other fancy cocktails that seem to abound these days.